GREETINGS FROM PICCADILLY, one of Manchester's largest open spaces - well, it is at the moment, but after Manchester City Council's redevelopment proposals have been carried out, it won't be any longer. 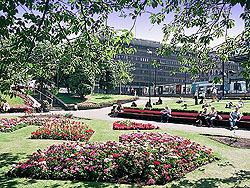 Under the plans, a multi-storey block is to be constructed on the south west part of Piccadilly Gardens (the orange area, right), the north east part will be adorned with walk-through fountains and a bosque (explanation below), the sunken gardens will be filled in replaced by a large expanse of grass, and a Japanese style pavilion with a concrete wall will be built on the Piccadilly Plaza side. What follows is a letter to Manchester City Council protesting against these plans. The redevelopment proposals are ill-conceived, inappropriate and completely out of character with the area. 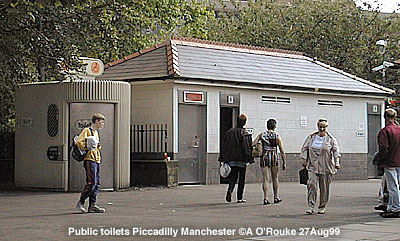 THE FIRST THING WE SEE as we walk from Oldham St are the public toilets, the only new facility to be introduced to Piccadilly Gardens in many years. Otherwise this area is dirty, dingy and run-down. Your proposal for this spot is a set of walk-through fountains set in an oval-shaped enclosure with a sort of hump-back footbridge. I find this idea highly inappropriate for this location, particularly in view of the the local climate. It seems amazing and ironic that in a city reputed by popular myth to be rainy, that you want to add to this perceived rainfall by artificial means. A feature such as this will only be appreciated during hot, sunny weather, particularly by youths who have nowhere else to splash about due to Manchester's appalling lack of outdoor water facilities. At other times of the year, the area will I'm sure soon start to collect discarded paper, drink cans and other rubbish. Click here to see the QTVR panorama. Here at the top end of Piccadilly we can see the wide open area created by the Metrolink lines. You propose a "bosque" for this area. Most people won't know what this is. You didn't explain it in your exhibition - I had to look it up in the dictionary. It means "wood" however I understand that the proposed Piccadilly "bosque" is a row of small trees in pots. However, I'm still not entirely sure what you're proposing, but whatever it is, it looks to be seriously out of character with the surrounding area and I don't like it. 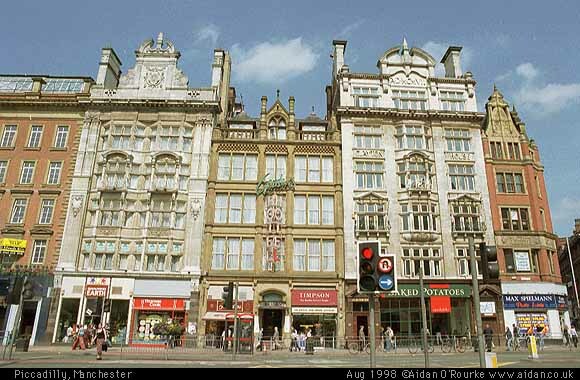 We can see from the photos above and right that this part of Piccadilly has some very beautiful buildings, with a strongly 1930's neo-classical character - The Debenhams building, the former cinema right and the landscaping of the Gardens all date from around this time or just before. The statues are all of 19th century design. I feel very strongly that any new development should have a character which is in harmony with this, unlike your proposal, aptly described by someone as a sort of "nouvelle cuisine international style", a late 90's architectural fashion which seems to be taking over many other parts of Manchester at the moment. The oval-based, brushed-steel, minimalist, "extra-terrestrial" look may suit Tokyo, Hulme Park or the set of a sci-fi movie, but not Piccadilly. 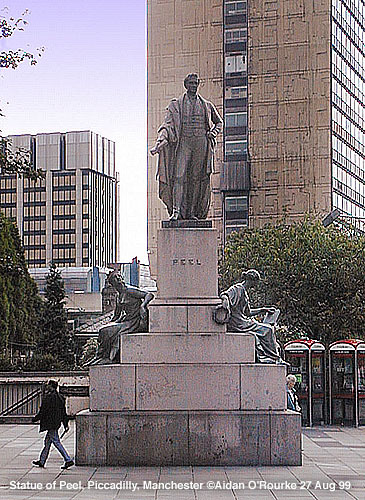 I would propose a larger Piccadilly Gardens in "contemporary classical" style, extending beyond the Peel statue and into the area occupied by the tram lines on the left. 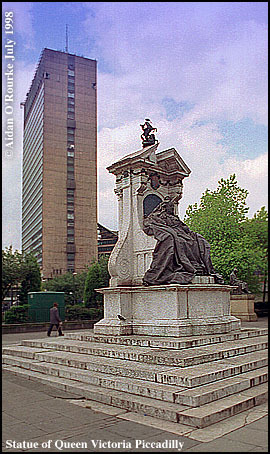 A design example which springs to mind are the gates in honour of the Queen Mother, Hyde Park Corner, London. Come to think of it, how would they restore and renovate St James's Park in London? That's how we should redesign Piccadilly Gardens in Manchester. 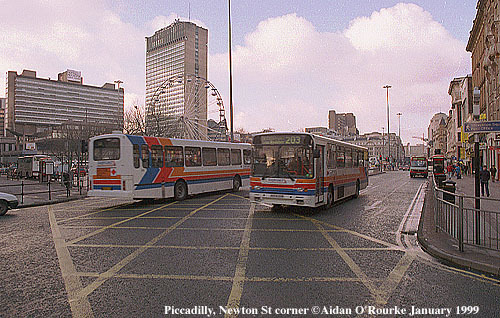 And there's nothing wrong with emulating London, after all, that's where the name 'Piccadilly' came from. By the way, one of the points left undecided in the plan was the fate of the statues, including the Peel Statue and the Wellington Statue. They should be left exactly where they have stood for nearly a century and a half, and the Gardens should be extended beyond and round them. In picture (right) we can see the remains of the original wall dating from the 19th century or before. 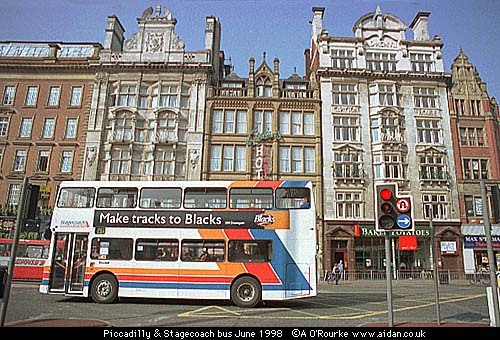 Not many people are aware that this used to be the top end of George Street, and that across the street, a triangular shaped block of buildings stood where the tram lines are now. It was destroyed in the Blitz, leading to the enlargement of Piccadilly into the broad impressive space it is today. Ironic, then, that 60 years later you plan to construct a building at the opposite end of Piccadilly which will reduce its size to smaller than in was pre 1940. We'll come to this in a moment. 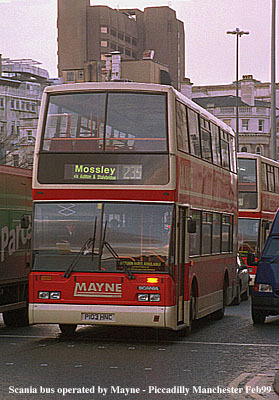 One of the problems of Piccadilly Gardens is the imbalance created by the construction of the Metrolink lines in 1991 and 92. 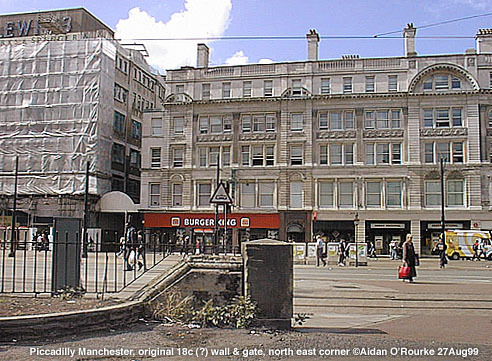 In the picture above we can see how the whole of the top end of Piccadilly, previously occupied by bus stands, is taken up by tram lines and is effectively wasted. 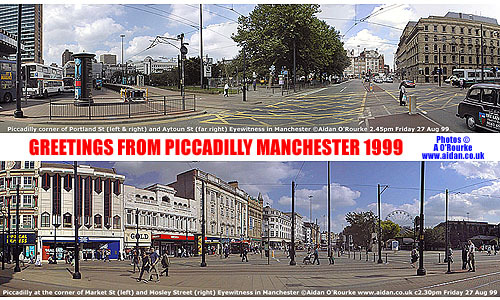 In fact, Piccadilly should have been remodelled at the same time the Metrolink was put in. 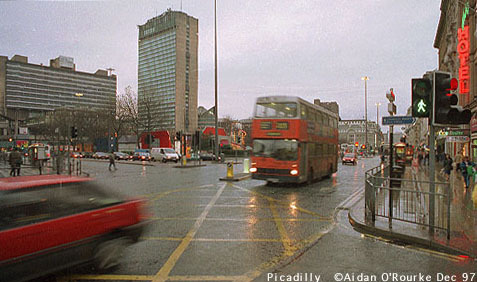 Let's walk over to Piccadilly Plaza - this area has for a long time been run-down. You propose to improve the quality of building, changing the overhang along Parker St, upgrading the shop windows and improving the lighting- I broadly approve of these plans. 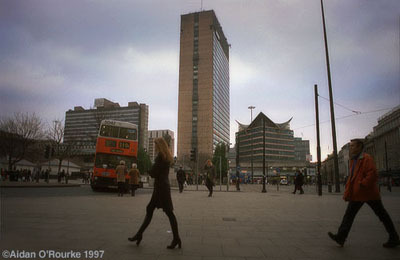 What I'm not so keen on is the idea, as part of the plan to redevelop Piccadilly Plaza, to demolish Bernard House. 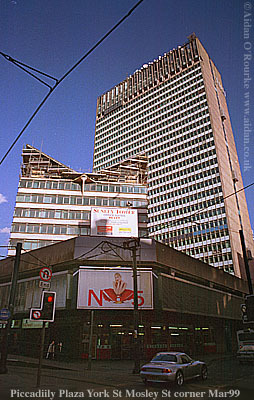 If we're going to keep Piccadilly Plaza, then let's keep is as much as possible to the original design. 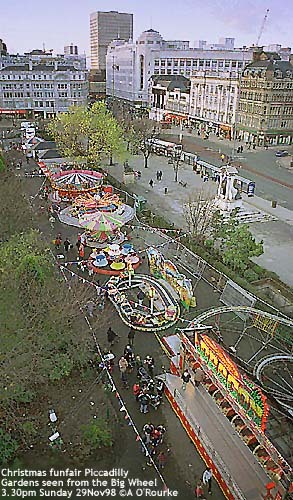 Let's cross over into Piccadilly Gardens. People often say the gardens are a run-down no-go area at night, and this is true, but on sunny days, many people enjoy going there, as can be seen in the pictures on the right. 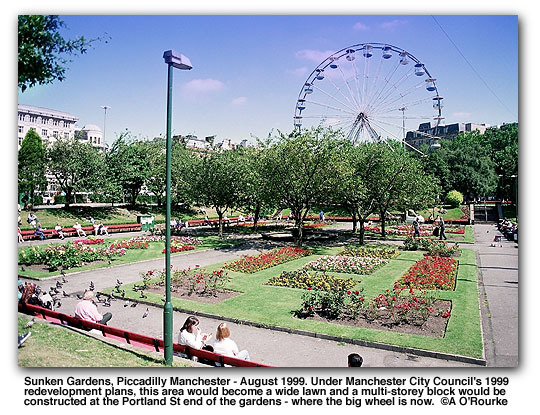 The sunken gardens are a familiar and well-loved spot in Manchester city centre and should in my opinion be kept. I strongly disapprove of the proposed "pavilion" with its curved concete wall dividing the gardens from the buses. Again, it is out of character with the area, and the use of concrete has been proven to be an unattractive building material in our climate. Such a building may look great in downtown Tokyo, but not in the centre of Manchester. Anyway, I don't think it's necessary to divide the buses from the Gardens in this way. 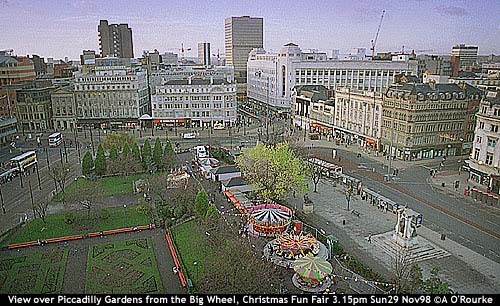 We can see in the panorama above that in fact the main explanation of why the Gardens are less pleasant than they should be is not "lack of a walk-through fountain" or "outmoded, unfashionable layout", but the fact that you, Manchester City Council, have failed to maintain them properly for the past 7 years or so. If the Gardens had been given at the minimum repair and maintenance, they would not be in the state they are in now. 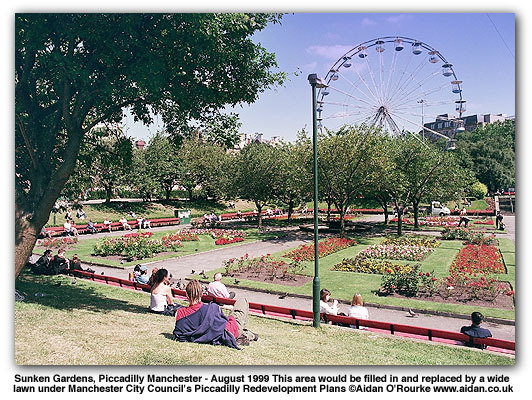 In fact, I find Piccadilly Gardens rather pleasant, as can be seen in the picture above - Have Piccadilly Gardens really deteriorated so far beyond the point of no return that they should now be condemned, bulldozed and built over? Coming down to the Portland Street end of Piccadilly Gardens, we can see in this picture the place where the proposed building would stand. Do you really think that the people of Manchester are overwhelmingly in favour of a building on the spot currently occupied by the trees? I have tried very crudely to superimpose a structure on the proposed spot. You haven't specified the design, so this is the best I can do. 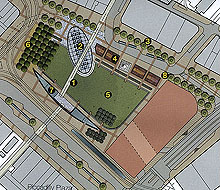 But whatever the design, it's clear that that the area is better left a green open space. 240 years ago, Sir Oswald Mosley donated the land which is now Piccadilly for the building of a new infirmary on condition that it would always be kept for public use (Guide Across Manchester by Philip Atkins, page 22). The Infirmary was demolished in the 1900's, and various plans for buildings were dropped in favour of simply leaving the site a green, open space. It is outrageous that Manchester City Council should now decide, behind closed doors, to sell off this green space in the heart of the city for construction. 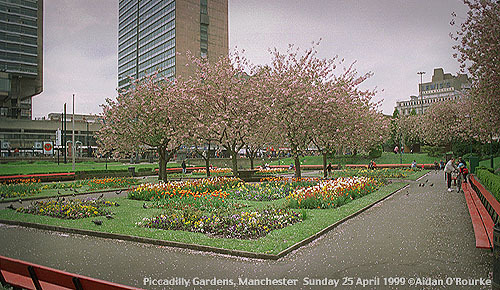 Leave my Piccadilly Gardens alone! 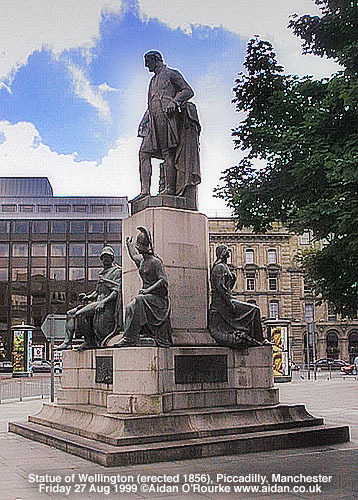 As we walk by the statue of Wellington and Queen Victoria, we are again struck by the air of terminal neglect, and the tackiness of the surroundings. As I've stated previously, this didn't just happen of its own accord - it has happened because Manchester City Council has neglected to repair and maintain the area properly. But the fact that you have neglected the area is not a sufficient reason to bulldoze it and put something inappropriate in its place. I note that horticultural gardens are planned for either side of the statue of Queen Victoria. Again, my reaction is that these would be suitable for an out-of-town location, but not here in the heart of the city. Walk-through fountains, "bosque", concrete pavilion, horticultural gardens - it seems the designers have gone overboard with gimmicky ideas. 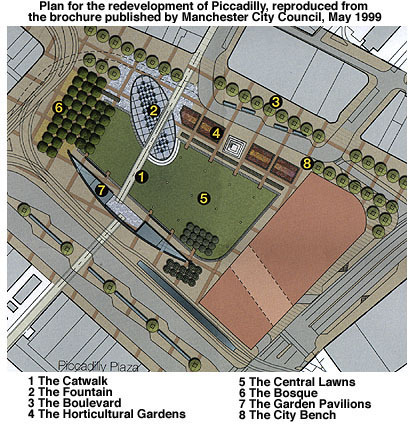 A balanced, uncontroversial and less costly redevelopment scheme, which doesn't require sacrificing part of Piccadilly Gardens for construction, would be a far better solution and, I think, more in keeping with the wishes of the people of Manchester, and of the many visitors who come to our city. Arriving back at our starting point, we've seen much to give cause for concern, but Piccadilly has the potential to be restored to what it was until recently - and better - a spacious, pleasant and traditional style garden in the heart of the city. Manchester City Council, you have done some very good work in the redevelopment of the city centre in recent years. 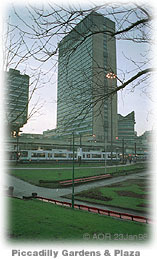 You appear to have learned your lesson from projects such as the Market St obelisk, the fountains in Brazennose Square and St Ann's Square, the Arndale Centre exterior, the demolition of York House, the Hulme Crescents, Piccadilly Plaza, and many other post-war examples of bad city planning. However, this case may cap the lot of them if it ever goes ahead. You must concede that if your plans don't have the approval of local people and other interested parties - and I believe they don't - then you must abandon them and start again. If you'd like to express your opinions to Manchester City Council, either for or against the proposals, you should write to the following address, preferably before the 12th of September: Manchester City Council, Assistant Director (Planning), Environment & Development, PO Box 463, Manchester M60 3NY - ref 056972 and 056973/VO/CITY2/99. Phew, I'll get down off my soap box now and calm down. Another Eyewitness update will follow on or around the weekend. Goodbye from a warm and muggy Manchester.